Dental implants are an ideal solution to replace missing teeth. Not only do they look and feel like your natural teeth, they function just like them. A dental implant is comprised of two main parts, the surgical and restorative phase. The titanium root form is surgically implanted into your jawbone. This form will serve just like your tooth’s natural root. Then, the bone grows around it in a process called osseointegration. You can see this illustrated in the image shown. Both Dr. Rothwell and Dr. Lenick rely on the talent of Dr. Lenick’s husband, Dr. John Vargo to perform the oral surgery. Dr. Vargo has devoted his professional career to periodontics and implant dentistry. Then, during the restorative process, either Dr. Rothwell or Dr. Lenick will place a porcelain crown directly onto the fixture. This is the portion of the tooth that is visible above the gumline. It will be made to blend in beautifully with your surrounding teeth. 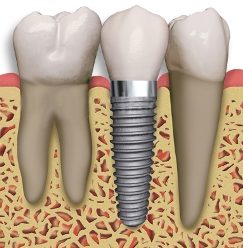 There is a healing period where the bone fuses with the implant that takes place between these two processes. The duration varies between patients, but can last up to six months. Dental implants can be very beneficial for patients that are missing all of their teeth. Dentures are the first thought most individuals have when they are in this situation. Although, you may not realize that there is a serious condition called facial collapse that occurs when you are missing all of your teeth. Your body no longer senses that the bone is necessary to support the teeth and resorbs the minerals to be used elsewhere in the body. Facial collapse takes place gradually over the course of ten to twenty years. An individual with facial collapse appears much older than they are and their face takes on a sunken look. The jawbone can deteriorate so much that the denture will become uncomfortable and it may be hard to keep in place. Dental implants prevent facial collapse from occurring because they are implanted directly into the jawbone. This stimulates bone growth around each implant. If your budget is an issue, as few as two implants can be used to secure a denture. They are stronger and more durable than other alternatives. They look and feel just like your natural teeth. Chewing efficiency is not reduced for excellent functionality. The porcelain crown is made to look so real that no one will be able to tell you are missing teeth. When dental implants are used to help secure a denture, they can help with stabilization and improve comfort. Implants also prevent facial collapse. There are some disadvantages associated with dental implants. The entire process can take several months, due to the healing period between the surgical and restorative phases. Also, implants cost more than other treatments. If you are in good overall health and have sufficient bone density, you are likely a good candidate for dental implants. If you already are dealing with bone loss, grafting can be done to help build up the bone. There is a lot to consider when deciding which treatment plan is right for you. Dr. Rothwell or Dr. Lenick will present all of your options to you honestly and will not try to pressure you into a certain type of treatment.